FDA 510K for multi resident and multi patient use. One in every three residents in long-term care have diabetes. Nationally, it costs an additional 14 billion dollars each year to care for these residents compared to residents without diabetes. 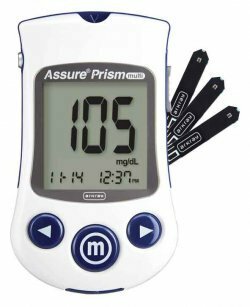 The Assure® Prism multi Blood Glucose Monitoring System provides healthcare professionals with a fast, accurate and easy way to monitor their residents’ blood glucose levels. The Assure Prism multi Blood Glucose Monitoring System has a clinically driven design and advanced technology. This multi-resident meter complies with ISO 15197:2013 accuracy requirements. Design features like a test strip that points toward the resident and backlit display are designed to make it easier for the healthcare professional to monitor a resident’s blood glucose level.